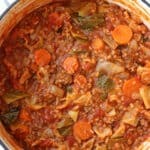 This easy Cabbage Roll Soup is just like traditional cabbage rolls without all that extra work. You will find this unstuffed soup version to be so simple to make with all the same great flavors you love in those little rolls. Brown ground beef in a large pot and drain any excess fat. Reduce heat and simmer 30 minutes, stirring frequently. Continue cooking until vegetables and rice are tender.